Kayak.com allows users to quickly search for the best deals in travel and accommodations for an upcoming trip. They act as a middle man, searching hundreds of other sites for you to find the best deals possible for your hotel and flight needs. Their award-winning mobile app has made them extremely popular with young travelers who need to be able to hunt down deals on the go. Kayak’s active blog is another big draw, especially for younger travelers who want the tips and ideas from travel experts. They frequently post blogs about the current trends in travel, marking the hot spots around the world, and also offering tips on what to see and how to do it on a budget. Their streamlined website and app finishes off the modern appeal, making Kayak one of the top choices for the Millennial traveler. Customers love Kayak’s simple layout and easy-to-use search features. Those are the two major draws to this travel website over all others. They place the price of each option far more prominently than other websites, and they allow you to keep your searches open in new tabs on the website itself, so you can quickly flip back and forth to compare options. This is great if you’re trying to decide between two destinations or routes. Another great feature that Kayak offers is the ability to search by deals rather than by specific dates, which is not typical of most travel booking websites. If you know you want to take a family trip next year, but don’t have a firm date in mind, you can easily search Kayak for the best packages that will save you money. And of course, the mobile app is the real shining star for Kayak’s service. You can get regular price alerts through the app, so you can book when hotels and flights for your destination are at their cheapest. You can also get flight updates to keep up with whether or not your flight is on time. Unfortunately, many users have found that Kayak does not show all the options during searches. For example, while you may see plenty of bookings for American Airlines flights, regular users have noted that Southwestern Airlines are frequently missing from the results list, even when they would have been the cheapest option. Another major drawback is the cancellation policy, which gives users very little time to back out of a booking. If you find that you’ve been charged twice by accident, or that your trip details have changed due to a family or work emergency, getting a refund can be a real pain. There are also frequent reports of hotel accommodations being cancelled by Kayak just days before the user was meant to check in. You also cannot book any kind of package deal that includes a rental vehicle. 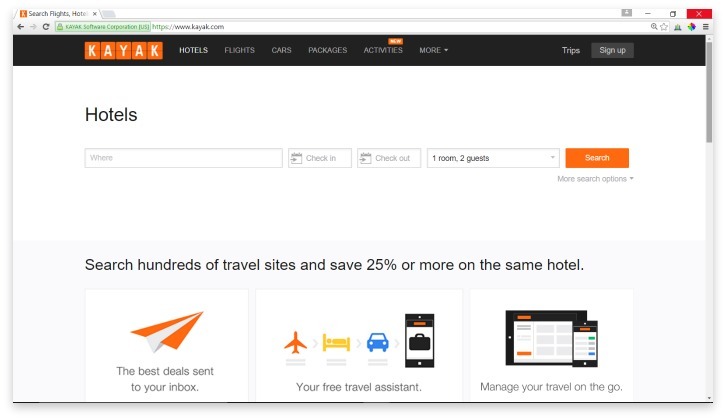 Kayak.com allows users to quickly search for the best deals in travel and accommodations by searching hundreds of other sites. Kayak is great for a certain type of traveler. If you are set in your plans, unlikely to need to cancel, and don’t require a rental car thanks to public transportation or proximity, then you’ll likely find that Kayak is a great way to compare many prices in an easy-to-use format. If you need to be absolutely sure that you’re spending only what you must and nothing more, there are probably better options for booking that will serve your needs. Have you had an experience with this company? Please share your Kayak reviews below.